I must honestly preface this review with the following observation: I had not yet found a live DVD from any band in any genre where the performing band seems to get past the multiple cameras rolling by and successfully fights the urge to “pose” and “make love to the camera.” After all, we all want to be stars, right? Warhol’s 15-minutes of fame, remember? Sure we do. Well, Exodus doesn’t care who’s taping them; they’re in it to win it, and they damn-well did! 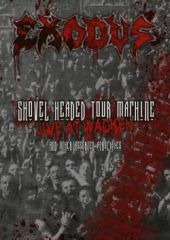 I can honestly say that this Shovel Headed Tour Machine DVD set is so much fun to watch you forget you’re sadly sitting at home and not even close to experiencing the fury and majesty that is the Wacken Fest. You Europeans don’t know how lucky you have it! Then again, maybe you do…enjoy it and never let it die! Anyway, back to the spectacle of Exodus shredding the ever-loving innards of its massive sea of people. Vocalist Rob Dukes slays the crowd with an unpretentious assault not easily found these days. The energy from these guys is absolutely amazing, I can’t stress this enough. Truth be told, and I’ll show my age here, I was exercising my dead weight when I watched this on my stationary bike and hit 20 damn miles before “Piranha” kicked in! My girlfriend, who was literally brought up on Bing Crosby, commented numerous times on the band being fun to watch and the crowd being equally as engaging. We old farts know that when the need surfaces, always look to the elders for perfection and Exodus delivers in every aspect. It is, in every facet, a fun DVD to own and watch again and again. The performance is one-hour of a spirited showing that only Tom Hunting and company could offer. I’m so glad to see this band still tearing it up after all of these years. With the wonderful and late Paul Baloff gone too soon from us, and Steve Souza possibly off trying to find his commitment yet again, Dukes aptly takes the reins and doesn’t let up. His vocal style fits the modern thrash band while retaining the early style just enough to straddle that fine line. His energy is also enough to get me tired just watching him! As far as camera work for this show, the angles are fun and give fair treatment to EVERY member of the band. I’m tired of watching videos and thinking to myself, “Well, I hear a drummer and a bassist there…so he must be there.” How many years did it take for us to see what Ian Hill really looks like? Everyone is a member on this DVD and the showcasing of each member is welcomed and appreciated. The crowd shots are not gratuitous; much to Duke’s dismay on a couple of occasions the crowd seems to be afraid of a full-on mosh pit. Obviously the crowd would have all suffered heart failure at the 1986 Slayer show here in Chicago where the entire floor turned into a pit! Still, the fact that I had to go back 24-years to recall something so astounding here in the States says something in itself. The Wacken crowd was into Exodus, throwing up obligatory horns and banging heads against the stage “and metal takes its price…” I stress sincerely that this show is hella fun to watch, my friends. I promise you a good time when you view it. Now the DVD of bonus material in this set consists of a five-year documentary on the band’s touring. There’s also a massive photo gallery filled with pics, ticket stubs and candid shots as well as promo videos for “Now Thy Death Day Come,” “Riot Act,” and “Problems.” The live footage from select places around the world is a fine plus to the set. There’s also deleted scenes that clock in at over an hour alone consisting of various interviews with the band, including footage of the band bringing out a ringer on stage to embarrass Gary Holt with his Yngwie-like shredding. There’s also the story of a Kirk Hammet-era Exodus being busted for stolen gear, including a little newspaper blurb about their arrests! The anecdotes are fast and furious and are funny and enlightening! For a DVD set to have such an amazing plethora of material covering all eras of its career is money well-spent. Especially cool is Gary Holt speaking candidly about Paul Baloff’s strokes and eventual demise and how they were pretty much the only family Baloff had. Also cool is the early Canadian interview from ’85 as well as the making of Shovel Headed Kill Machine. It’s certainly a nice trip back in time and a welcome view into the present day and how metal is still very much alive! For the history nerd like me these little anecdotes are invaluable. The Exodus set is well worth your interest, time, and money. The band has been slamming around for nearly 30-years and has yet to relent or throw in the towel. Things do get better with age and Exodus proves it in this DVD set. Buy it or have a Toxic Waltz done all over your head!